LondonJazz News: Is this your first group as leader? 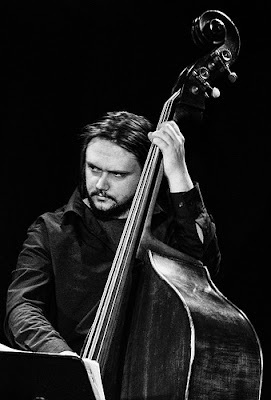 Calum Gourlay: I have a monthly residency at the Vortex with my Big Band, and many years ago I had a smaller project with some of the same players (Freddie Gavita, Mike Chillingworth, George Crowley and James Maddren). But this quartet is my first “real” band of this size, as we’ve got a recording session and tour booked already. Helena Kay on saxophone, Kieran McLeod on trombone and James Maddren on drums. CG: I think I first met Helena when I went back to Scotland to do a Fife Youth Jazz Orchestra workshop, having lived in London for a few years. She’s a FYJO alumnus like me, Andy Hamill, Jamie Anderson and quite a few others. I’ve really loved hearing her playing grow over the last few years and she’s been an important player in my big band since I started it. I first met Kieran in Tommy Smith’s Youth Jazz Orchestra and he also went to the academy about the same time I did. I absolutely love his trombone playing and he’s the kind of musician who can improvise with anything you give him and make it sound good. I met James Maddren at the academy about 2005 and I’ve tried to play with him constantly since then. He’s my favourite drummer and plays in such a composer-like way. I’ve always wanted to have a great quartet so I thought I'd go for it with this group of people. LJN: What was the original purpose of getting this group together? CG: This quartet started as a ‘workshop band’ for my Big Band compositions. I find it much easier to arrange something for big band if there's already a framework for it to fit around, as starting a big band piece from scratch is tough. So, every few months I try to organise a play with a quartet or trio of some people from the band and write some music just for them. If any of that works then I can scale it up for the big band. This group had a play together in June 2018 and it felt good. I think tenor sax and trombone sound great together and it’s a bit of an underused coupling, especially in big bands. I really enjoy the excitement of having fresh material every month and learning to write in a disciplined way so a new chart can work first time. Or nearly every first time. LJN: How do rehearsals work? CG: I’ve spent the last few weeks writing and working on some newer music and revisiting some older workshop pieces. We’ll rehearse the day before the debut Vortex gig, which is 30 January, and then record the following week. I know that Helena, Kieran and James are great at interpreting my music in a short space of time, because every month I bring a new tune to the Big Band residency to work through on the day. LJN: Does the group have a name yet? CG: I wanted to call it my Workshop Band but I had visions of people turning up with red trumpets wanting to play Cantaloupe Island. I want the project to have a name further down the line after I’ve finished the music. There are lots of Scots and Gaelic words for Satan that I’m currently going through. LJN: You don't have a harmony instrument? CG: I love playing without a harmony instrument and initially I wanted to do my big band without one either. You can write simple harmony or complicated harmony and because there's nothing spelling it in a vertical way it’ll still sound clear. There’s more space for the bass player too. LJN: Three (East Coast?) Scots and one (poor?) Southerner? CG: It really only occurred to me that it was a 75% Scottish band when James pointed it out. We’re even going to be playing in Aberdeen and Glasgow so it’s officially a UK tour. LJN: Best fuel for the band: Whisky or coffee? CG: Apparently you can mix both but I can't imagine why. LJN: Culinary leanings of this band? CG: Helena is a vegan. Kieran can’t eat crisps. James is an alcoholic and I’m only “clinically” obese. LJN: How's your Vortex Big Band going? CG: Its going great! It’s such a great experience writing every month for nearly two years now, and it’s an honour for me to play at the Vortex as much as I do. Ollie (Weindling) offered the gig to me after I asked on Facebook for some ideas about starting a residency and I leaped at the chance. We’ve just booked in the 2019 dates, the next one is 4 February, the evening of the album recording. I think it’s going to be an ‘interesting’ year in terms of what happens to the UK and the world, but I’m excited that in spite of the uncertainty I can look forward to playing my music with some of my favourite musicians each month to a supportive crowd. LJN: Anything else coming up for you?? CG: The Guildhall Big Band and Scott Stroman have asked me to lead a few sessions and a public gig on 19 February at the Guildhall. So I’ve been re-arranging my music and we’ve had a couple of rehearsals already. It’s massively out of my comfort zone and it’s weird not playing bass in it. They’re a great bunch of students and it should be a fun gig.